This ain't no joke of the day. This is our Zombie of the Week. The (undead) end is nigh! You have survived The Rapture (thanks to Macho Man). Now prepare yourself for a full-blown Zombie Apocalypse. According to the CDC, that is. 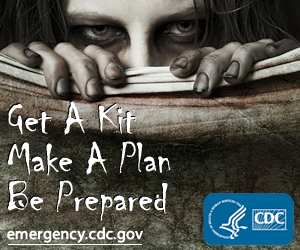 Yeah, that CDC (Centers for Disease Control and Prevention). Perhaps indicative of the growing status of zombies in popular culture thanks to the endless hordes of videogames depicting survival horror in a time of an undead outbreak and AMC's The Walking Dead TV series, CDC has published an article advising the dos-and-donts in the face of a Zombie Apocalypse. Entitled Preparedness 101: Zombie Apocalypse, the article proves to be adequately realistic notwithstanding some inevitable dosages of humor (both intended and not). In fact, they are so good that we, being The Daily Zombies, found ourselves obliged to provide an excerpt of the guideline. 1) Identify the types of emergencies that are possible in your area. Besides a zombie apocalypse, this may include floods, tornadoes, or earthquakes. If you are unsure contact your local Red Cross chapter for more information. 2)Pick a meeting place for your family to regroup in case zombies invade your home…or your town evacuates because of a hurricane. Pick one place right outside your home for sudden emergencies and one place outside of your neighborhood in case you are unable to return home right away. 3) Identify your emergency contacts. Make a list of local contacts like the police, fire department, and your local zombie response team. Also identify an out-of-state contact that you can call during an emergency to let the rest of your family know you are ok.
4) Plan your evacuation route. When zombies are hungry they won’t stop until they get food (i.e., brains), which means you need to get out of town fast! Plan where you would go and multiple routes you would take ahead of time so that the flesh eaters don’t have a chance! This is also helpful when natural disasters strike and you have to take shelter fast. Yeah, no worries. 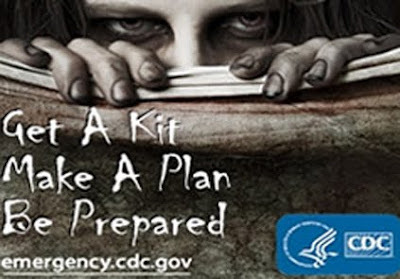 The CDC will be around to conduct an investigation, provide technical assistance to cities, states, or international partners dealing with a zombie infestation, blah, blah, blah, all the stuffs they promised in the movies, video games, and TV series. And you are pretty clear where this storyline is going, don't you?